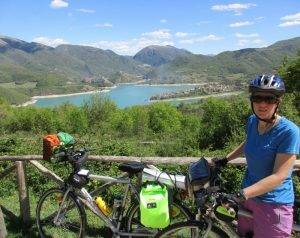 We had an enforced rest day today, Jenny being a sad cycle tourist who could not cycle! 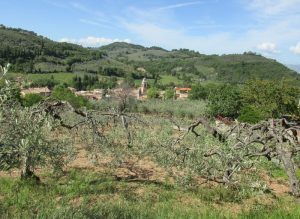 We were staying in a bed and breakfast run by an Italian family, in the countryside. 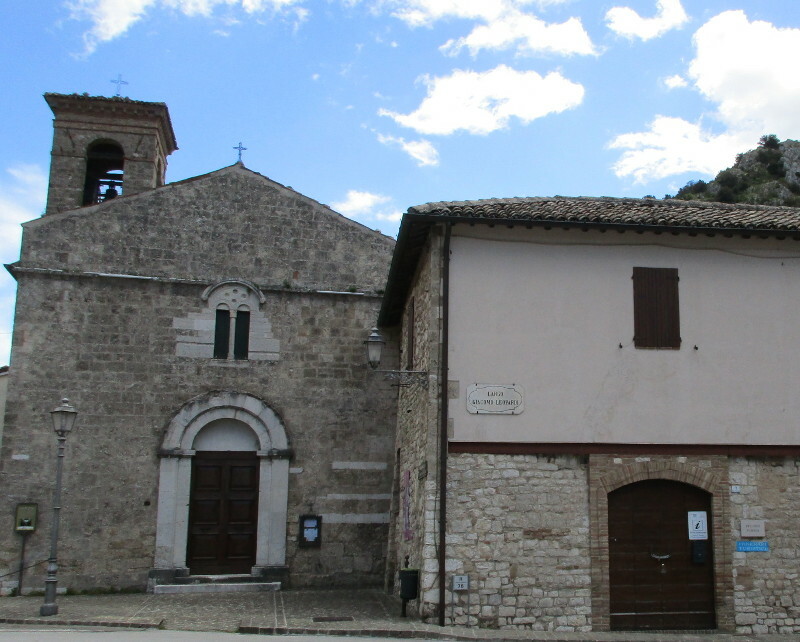 They have three small children – aged 9, 6 and 2 (Giordano, Luigi and Fiore). The six year old has Downs Syndrome and doesn’t talk. They are vegetarians and attempting some small scale farming, including bee keeping. She makes very nice bread, jam and food. Luckily they are very accommodating and were able to let us stay in the room for another night. Breakfast was included in the accommodation, but Anna also provided additional meals. 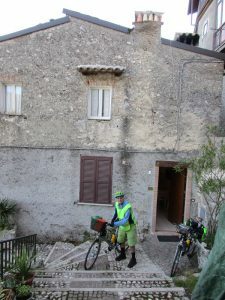 In the morning, we went to take the children to school in a nearby town with Anna – rather than just stay at the house. After dropping the two oldest children off, we went to a “bar” to drink a coffee while waiting for the nursery school to open. The little girl had a pastry and some milk – they eat sweet breakfasts from an early age. Once the kids were dispatched, Anna dropped us off at the town of Pioraco to have a look around while she went to yoga and to do some chores. 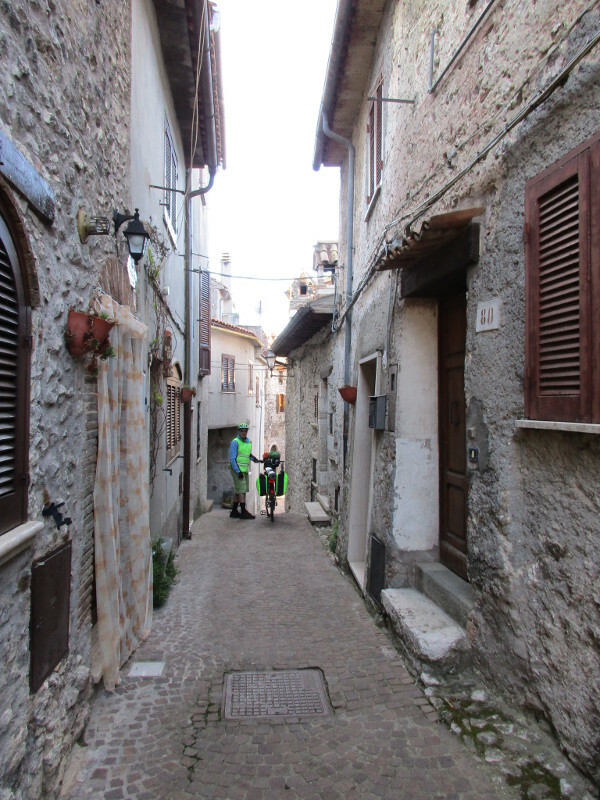 It is a historic tourist town, but very quiet, as it is out of season. We walked around slowly (Jenny’s leg was still sore). 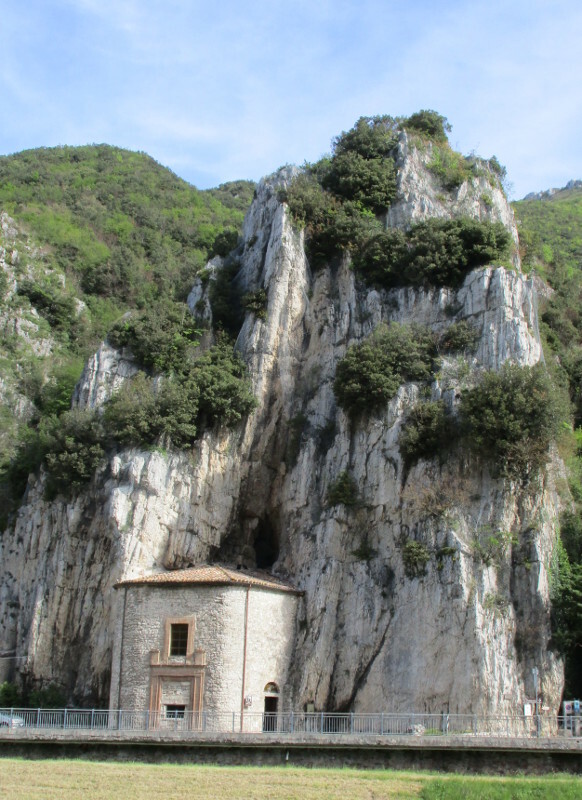 There is a church built into the rock. 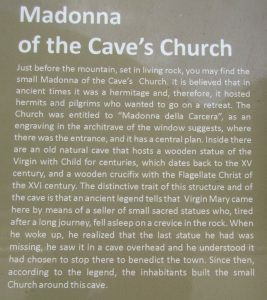 Evidently there are limestone caves under the town. 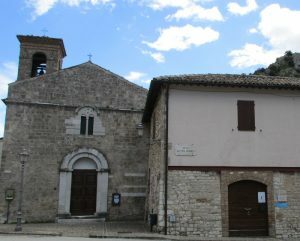 There was also a historic 14th century Franciscan church and monastery, built on a Roman theater. 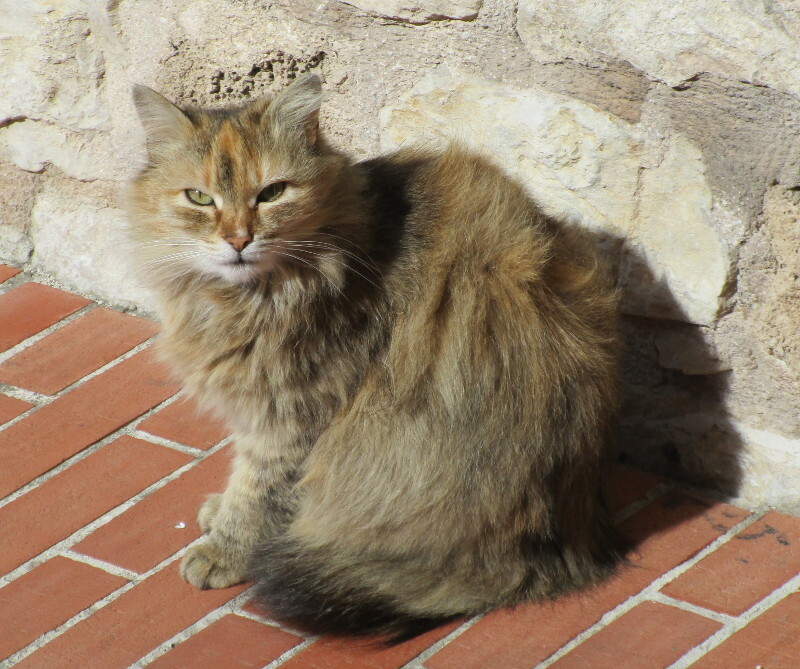 There were a lot of stray cats around, sunning themselves. We saw an old lady lining plastic bottles of water up outside her shop (selling dolls), and were later told that this is to stop the cats from peeing on the doorway. After lunch we did some route planning, and then went for a walk through the woods above the property with Anna and the eldest son Giordano. We learned about their experiences with the big earthquake last year. The towns that were destroyed were not far from here. The family spent the night in the car and the aftershocks only stopped about a month ago. A lot of people have left the area since and it has become quite depressed. We fell asleep very early again. Today was a bit of a disaster, because I fell off the bike and injured myself. However it started out well, with a good breakfast at the hotel. This hotel obviously caters for nationalities other than Italian, as there was bread, cheese, fruit, yogurt, muesli for breakfast – as well as cake and excellent coffee. We met another guest over breakfast – a very healthy looking older Dutch man who was walking a pilgrim trail – about 20km per day. Our travel distance was modest today – only 45km – so planned because we knew there would be some big hill climbs. 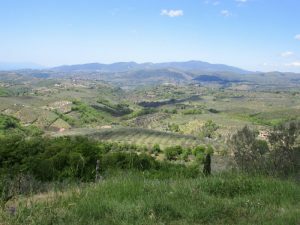 The first hill presented a long hot climb, alongside olive trees again. We pushed the bikes up part of the way. 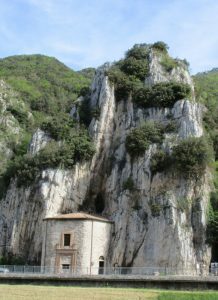 The steep narrow road “Strada Comunale di Liè” was also used as a walking track by a woman who was possibly a pilgrim. We then traveled on a road that snaked alongside the bigger SS3 for most of the day – with very little traffic. We paused briefly at the town of Nocera Umbra, before we turned east on another small road for a big hill climb. Here is the view of the town on our way up the hill. The road was very quiet – no one around. We rode past some ski fields. 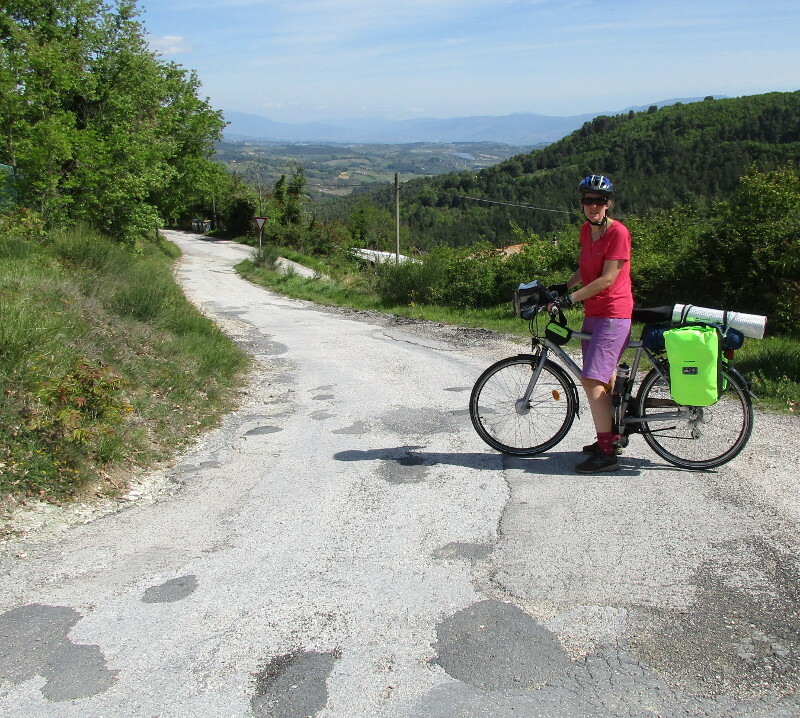 Then down the other side – the road condition was awful – lots of patches and pot holes and patches of lose gravel – which turned out to be my downfall. This photo was taken just before my fall. 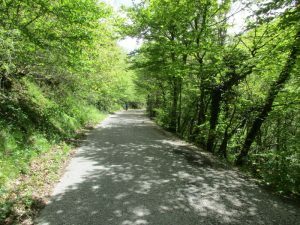 I came off the bike on some gravel, not at very high speed because I was nervous with the poor road conditions on the steep hill – I managed to cut my knee open quite badly – right through the skin. The bicycle was fine so I got back on and caught up with Kris. I cleaned the knee with a sterile wipe at the side of the road, but couldn’t get a bandage to stick, so in the end I just rode on with the open wound – stopping every now and then to prevent blood from flowing onto my socks. We were about 8km from our destination. Kris sent a text message to the accommodation to ask if there was a nurse or doctor in the village who could stitch up a knee. I was not feeling too bad – the last few km were quite easy and I went slowly – I even stopped to to take some photos of the beautiful countryside. Here is Kris catching up with me after sending a text. 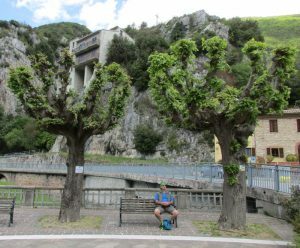 When we reached the small village of Molinaccio, I waited at the center by a little church while Kris went on ahead to find our accommodation – about a kilometer away. After a few minutes, a man came by in a pick up truck and stopped because he saw my bleeding knee. He didn’t speak any English of course, but phoned someone on his mobile phone. A few minutes later another man appeared in a small car with a first aid kit. 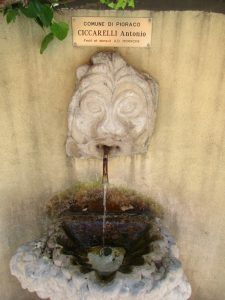 They sat me down at the water fountain, and began to administer first aid – cleaning the knee and applying a bandage. In the meantime Kris reappeared with our hostess Anna, also with first aid kit. 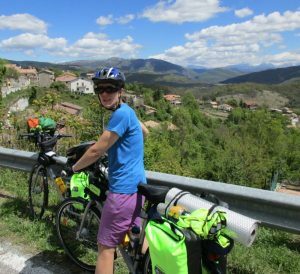 Anna took me to the hospital emergency department at Fabriano – about 20km away – while Kris took my bicycle back to their place. I can report that the Italian medical system is excellent. They were unsure how to process me at first – looked at my passport and took my NZ address – evidently I came up on their system as a homeless person. Then we only had to wait for about 20 minutes. The doctor spoke English and had two nurses assisting him. I got the full treatment -they washed out the wound for a long time and very thoroughly which was excruciating – “there are lots of little stones in your knee” – he said. The doctor checked the ligaments (fine), they X-rayed the knee from three different angles, gave me a tetanus shot, antibiotic pill, local anesthetic (very painful!) and nine stitches across my knee. I was out of there in not time clutching a script for the rest of the antibiotic treatment. 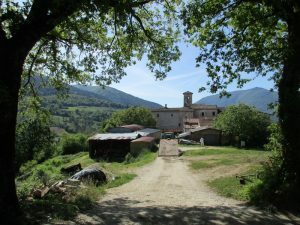 I had to pay about 14 Euros for the antibiotics and some bandages at the next door pharmacy – but otherwise there was no charge for my treatment at all. 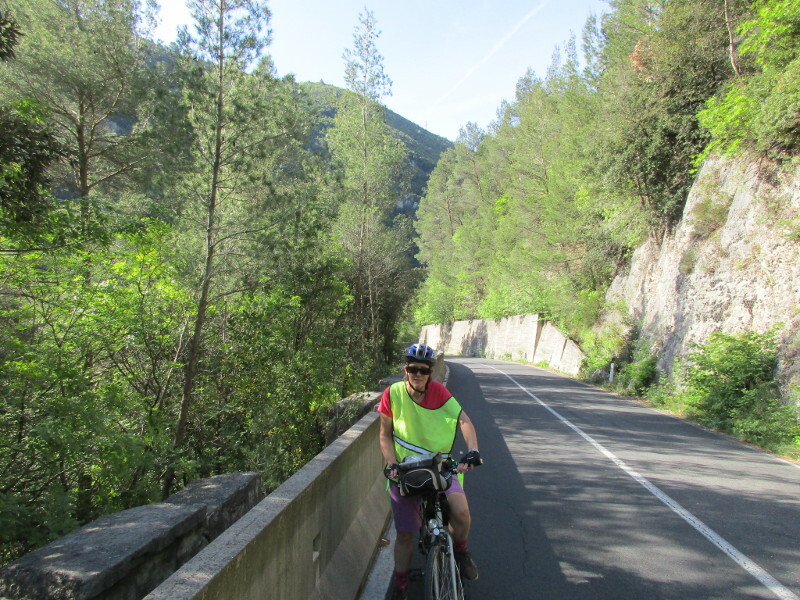 I only realised that I left my merino hoody in the hospital when we got back home – it served me well on all our previous bicycle trips and was getting a bit worn – now I will need to replace it. We had our first Italian hotel breakfast (included in the price) – and were not too impressed – plain cake (homemade evidently) and coffee. The coffee was good – it is good everywhere in Italy. Not the type of breakfast a cyclist needs! 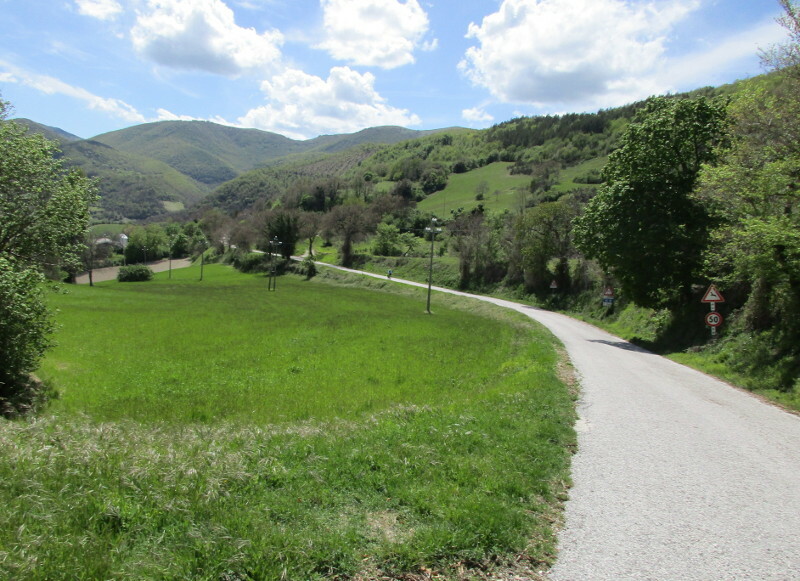 Our ride was a manageable 68km today, most of the day on a small regional road – the SP67. 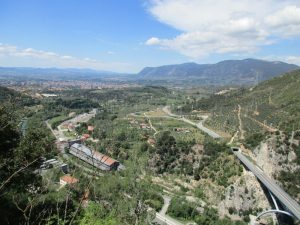 It started with a long hill climb straight out of the city – through a green gorge with a train track running far down below. 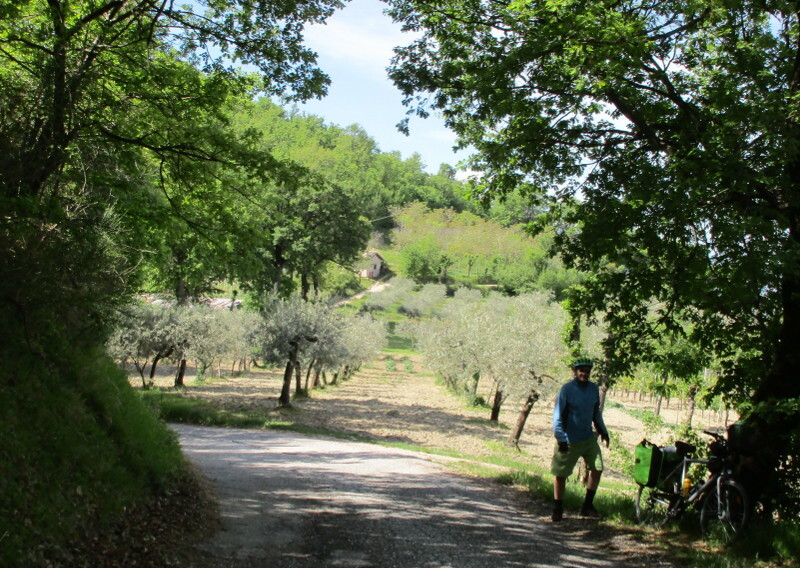 The road got even smaller and we stopped part way up for a picnic – supplementing our breakfast with some left-over olives, cheese and tomatoes. More hills on small country roads. Once we got onto the flat we had a tailwind behind us and made great progress, cruising along. 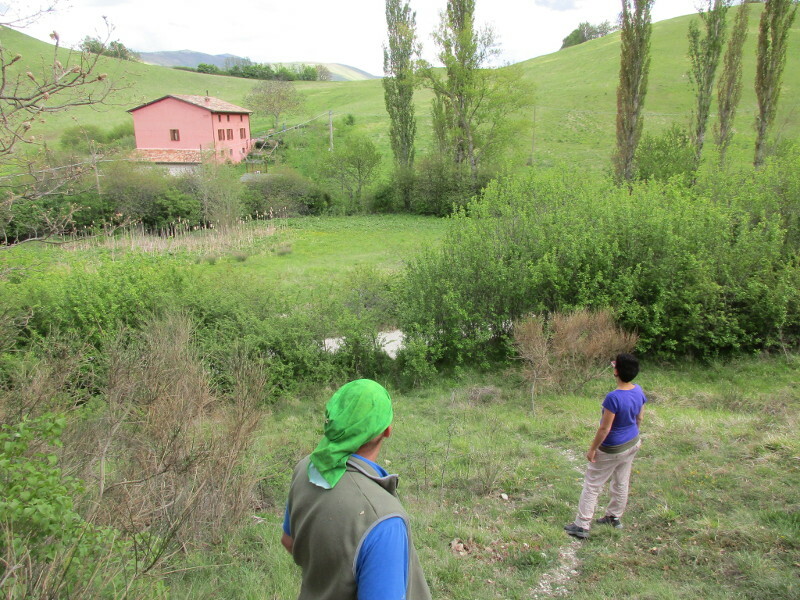 At one point we found ourselves cutting through some freshly ploughed fields with irrigation channels on either side. 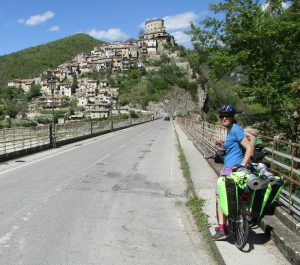 We rode on a cycle path alongside a canal at one point, and then into the town of Foligno. Everything was very quiet and we were surprised – almost no people about and most shops closed. Later on we figured out that it was a public holiday (May Day). We did find a supermarket that was open, to buy some ice cream and food before finding our hotel. We had a quick ride through the old city on the way. Our hotel is very nice (3 star), quiet and comfortable. 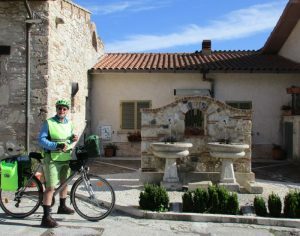 We had another great ride today – 74km on smaller country rodes. 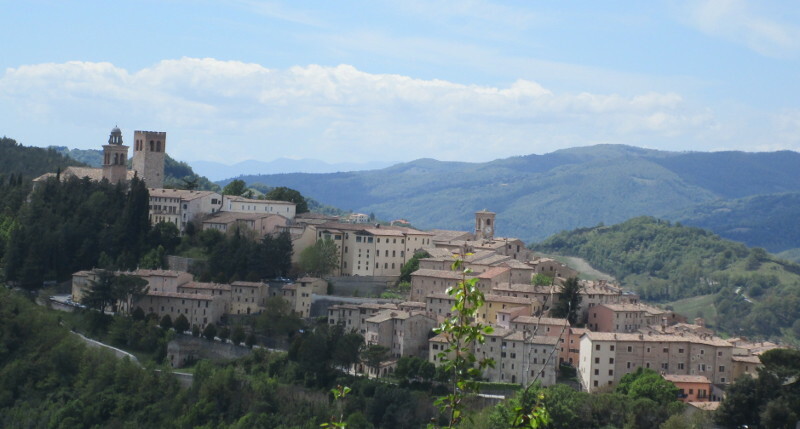 Our final destination – Terni. Not too many hill climbs today either (just a few gentle ones), and quite a number of long downhill runs. We started out leaving our medieval town on the other side (awkward getting our bikes down narrow alley ways and steep stairs), and taking a “farm road” on the opposite side of the lake. There were wonderful views across the lake. It was all great until we got to a washout and couldn’t continue. Jenny was ready to turn around, but Kris took the bikes over the obstacle – it turned out to be only about 80m – and then we were back on tar. He cut his leg on the pedal in the process. The moral of the story is that the difficult route may sometimes still be the best option. We passed through another gorgeous old town – Posticciola – on the hill by the lake and stopped for a water refill. it was very quiet being a Sunday morning – just a few old men around. Then a long downhill run – exhilaration – passing a man on a horse. We meandered through the countryside following the valley for a while. The countryside opened up and we deviated from the main roads on very small rural roads. We still came across the odd cyclists out training today, but not as many as yesterday. Still no other cycle tourists around. 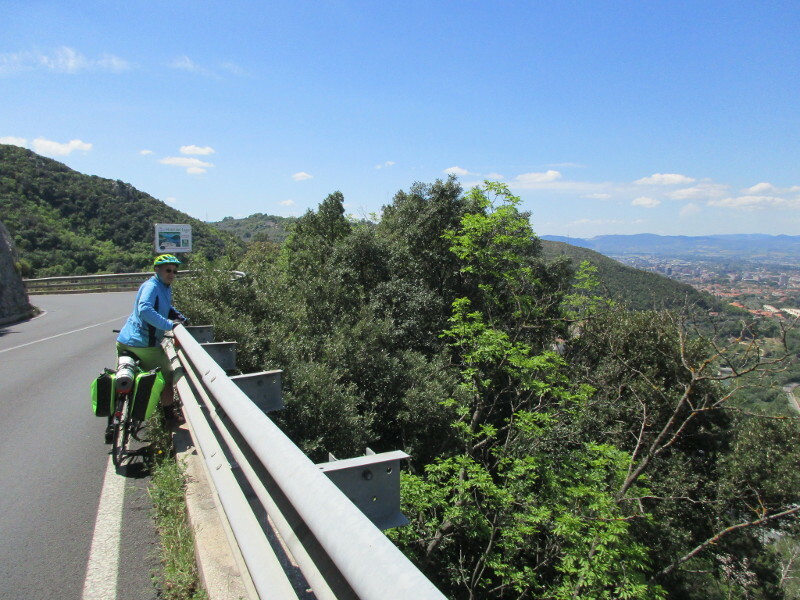 The last 7km into Terni was a huge downhill drop down a mountain pass – I was just happy we were going down and not up! 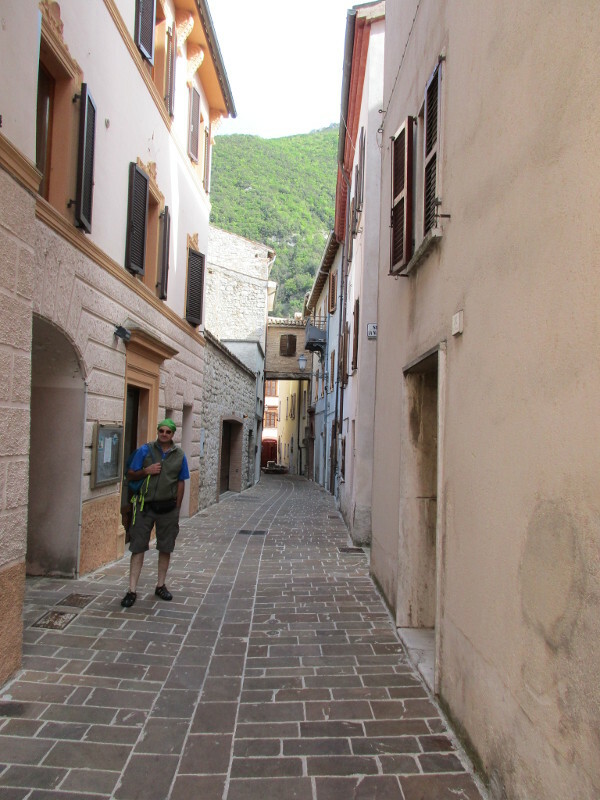 The town was very quiet, everything closed up. We got to our accommodation – a cheap hotel – and had a pasta and some wine in their restaurant. Then we went out looking for a supermarket for some food for the evening. This took about another 10km riding around town by the time we found one that was open and got back. The hotel was not great as there was traffic noise – especially early in the evening when we went to bed – however we were so tired that it didn’t keep us awake too long. 29 April – this is more like it! We had a beautiful day cycling! The secret is to get out of the city and into the country side. It was Saturday and the sun was shining. Once we had cleared Tivoli, which was quite snarled up with traffic, and got onto the SR5, we began to come across other cyclists. They were all clad in Lycra and on faster bikes than ours. We did manage to slipstream a pelaton for a little way, which was fun. The further on we got, the lighter the traffic. We stopped at a little town to buy some lollies and energy drinks. It was already getting hot and the terrain was hilly. From here we rode on the SP34, which was a joy. Most of the traffic was cyclists out training. They all greeted us and I learnt to say “Buongiorno” in return. We had a long steady uphill climb, with wonderful views. 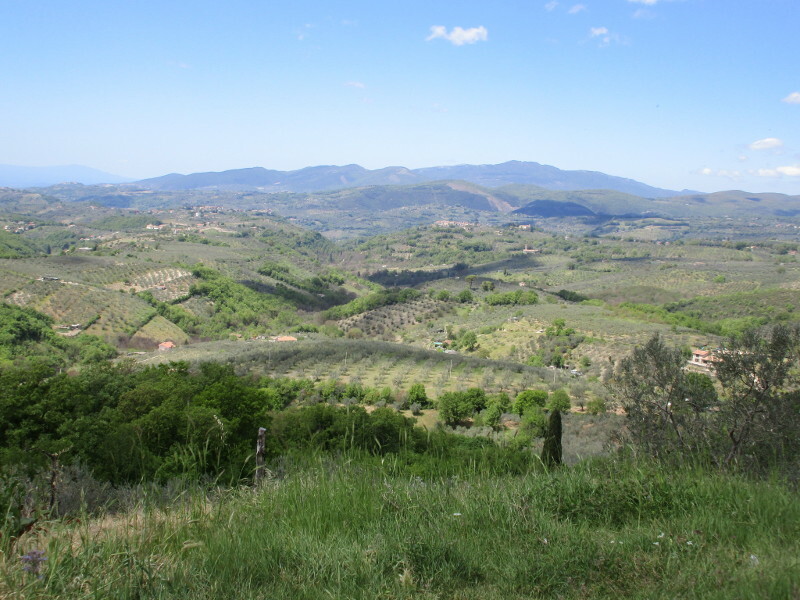 Many olive groves and terracotta villages clustered on the hilltops. 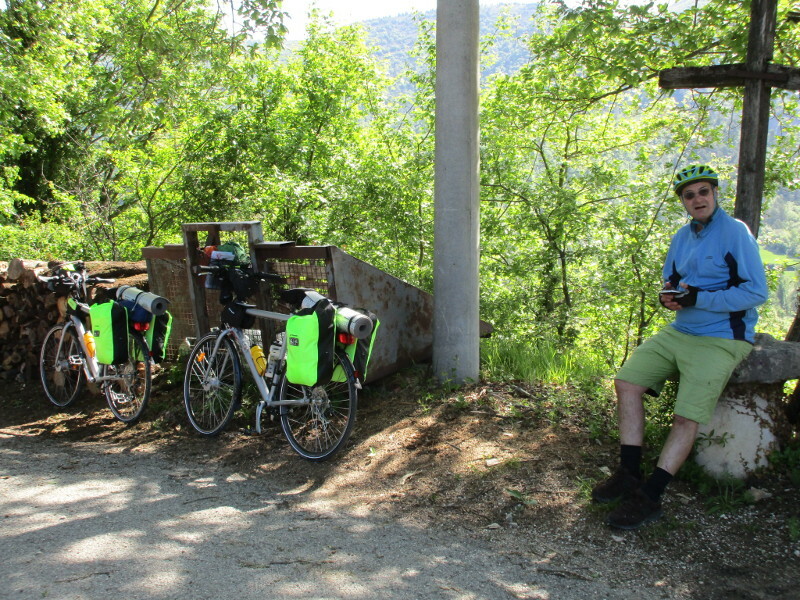 We enjoyed an exhilarating long downhill stretch with green vistas up ahead before turning off onto the SR314 – an even more remote route that Kris had found. This hill was even worse and we had to get off an push for part of it (getting hot and tired at this point). The uphill seemed an eternity, but we did eventually hit downhill. 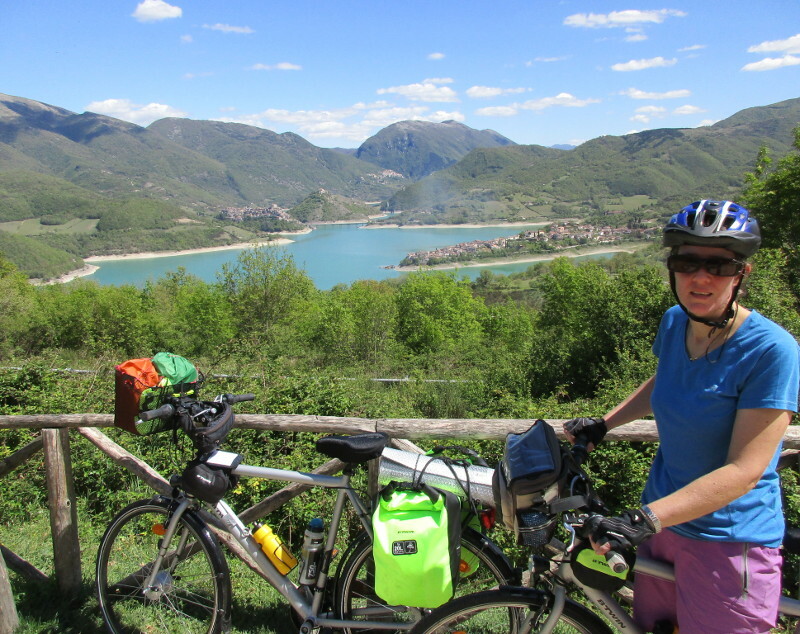 And then we came to this wonderful lookout with view over the lake Largo del Turano. 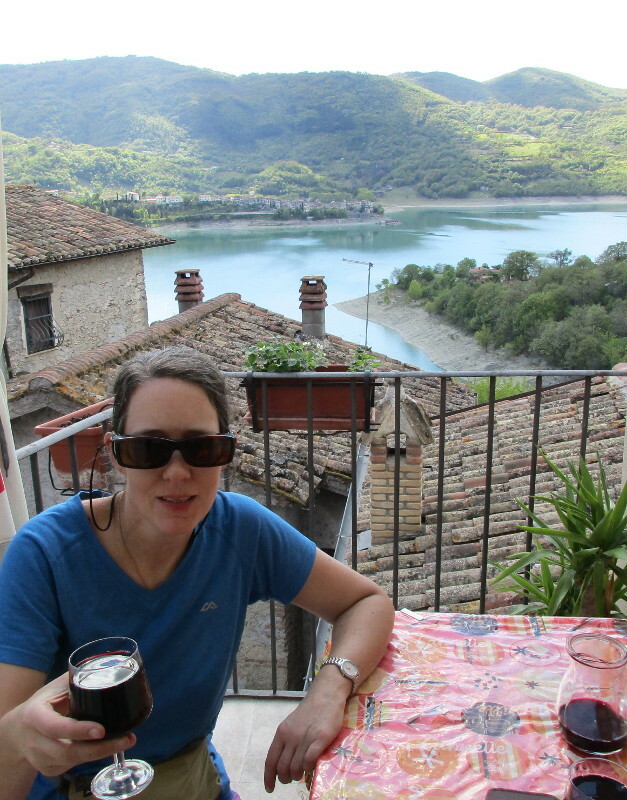 From here we circled around the lake to the bridge that takes us over to Castel di Tora, the old medieval town where I had booked our accommodation. 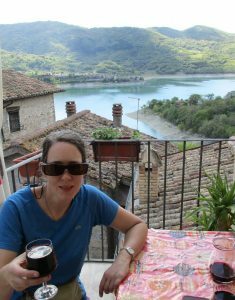 We were starving by this time, so went to a small restaurant at the side of the lake to eat pasta and drink a beer. 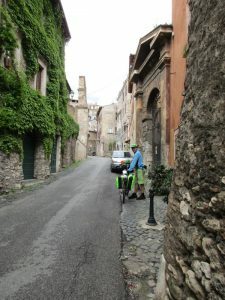 Getting the bikes up into the medieval town was a mission – really really steep – hard to push the heavy bike up there. Once there we had difficulty finding the accommodation – went to the wrong house. A passer by stopped to help, and soon a small group gathered. Eventually we were led to the accommodation. 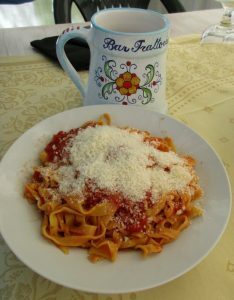 Just the maid was there – and she could only speak Italian. It was a bit of a shambles as the room was not ready (it was 4pm). She locked out bicycles in a nearby store room and we went to have a drink at the village bar nearby (red wine). She could not give us the key to the bicycle lock up, so we ended up putting the bikes in the apartment – which was pretty cramped regardless. Anyway, it had all the facilities including a washing machine and drying line on the balcony. Also a balcony with a wonderful view of the lake. We bought some food at the local shop, and were planning to go back to the village bar for dinner. However we both fell asleep at about 6pm. When we woke again at 11pm, we decided that we would not go out again after all. Our sleep patterns are still disrupted – Kris and I were up at 3am drinking tea and making notes for the day’s ride. 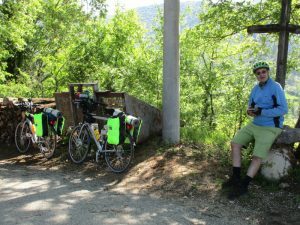 Our plans have changed, we are no longer going South to Bari, but rather cutting across the country to catch the ferry at Ancona (to Split). We did go back to sleep again for an hour or so, waking up again at 8.30am to a rainy morning. 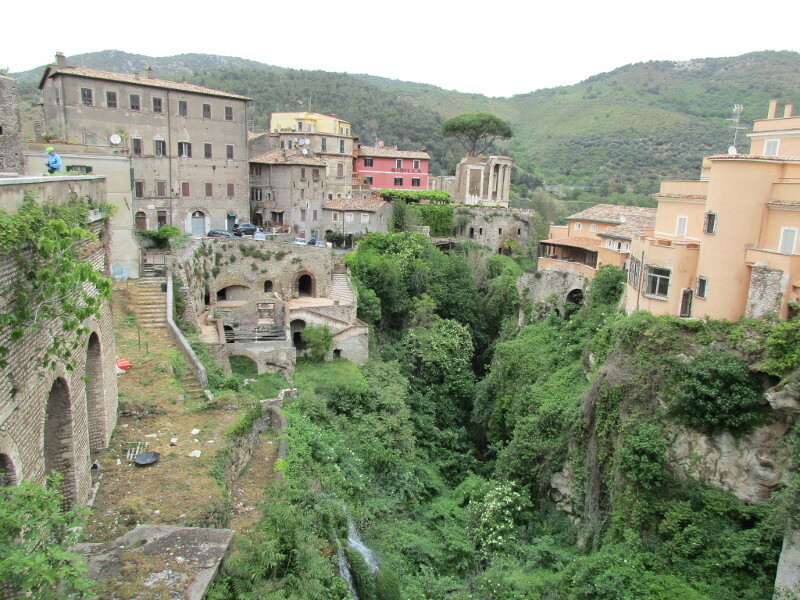 We set off in the light rain to the dire warnings of our hostess about slippery Roman roads after rain. 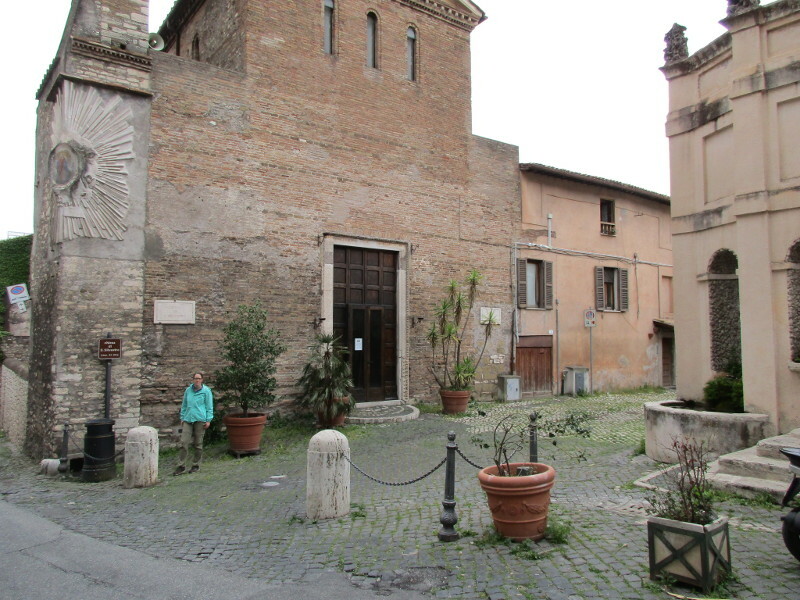 Luckily it didn’t last long and our rain coats were off long before we reached central Rome. We criss crossed a bit to find the right path, cutting across roads and a ran-shackled park at one point. 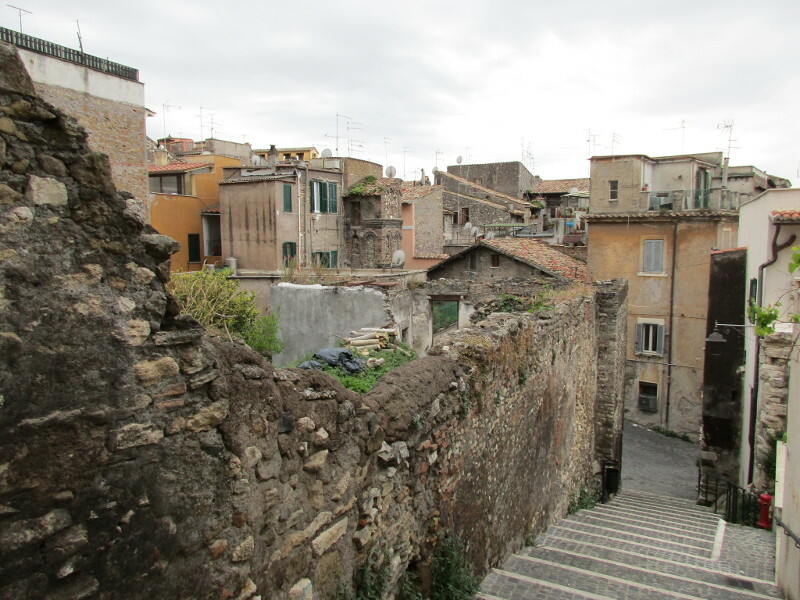 It was very exciting when we found an off road cycle way alongside Via Christoforo Columbo – this lasted for about 5km and ended when we entered central Rome through an old wall. 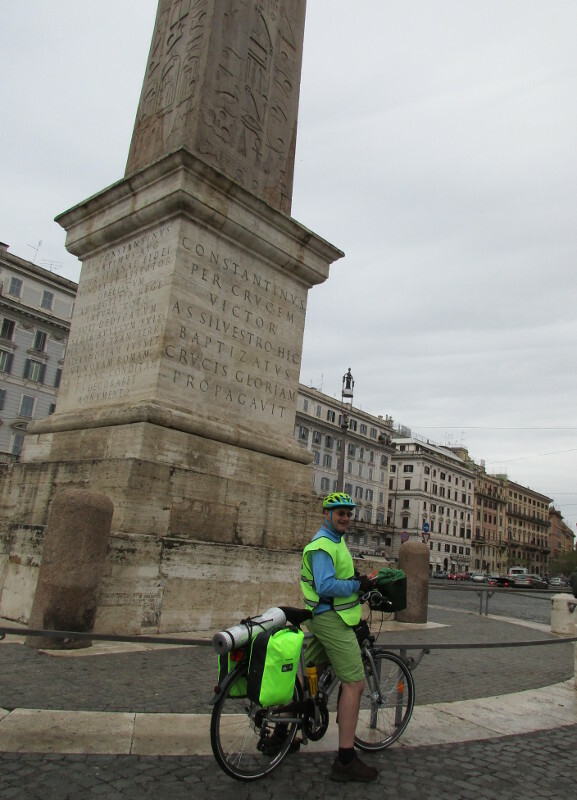 I actually enjoyed the ride through central Rome. The traffic is so slow that we were probably traveling just as fast as the cars, if not faster. We didn’t even try to navigate to the big ticket tourist sights, just passed through. 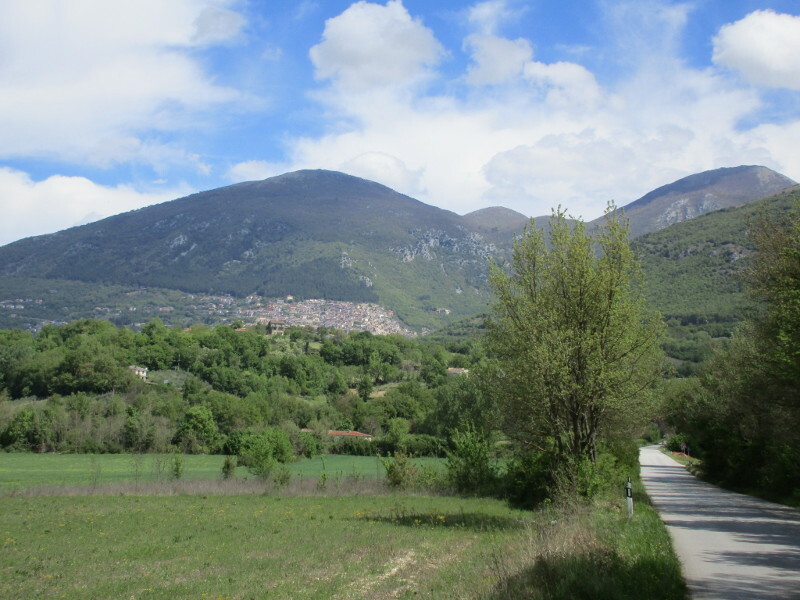 Once we found the Via Prenestina we were able to follow it for about 30km right out of the center. At one point we were overtaken by a young male runner going up a hill. He was training on the road alongside the traffic (probably not enough room on the pavement). It was entertaining when he just ran through every red traffic light without a pause. We only got past him again after a few traffic lights. Before we knew it, we were riding through green fields, dotted with the odd rundown satellite settlement. The further from the center, the faster the traffic (not so pleasant). The condition of the roads also deteriorated the further we got from the center. The last stretches of road before Tivoli were really busy, until we got onto our final uphill stretch to the town, which is on a hill. 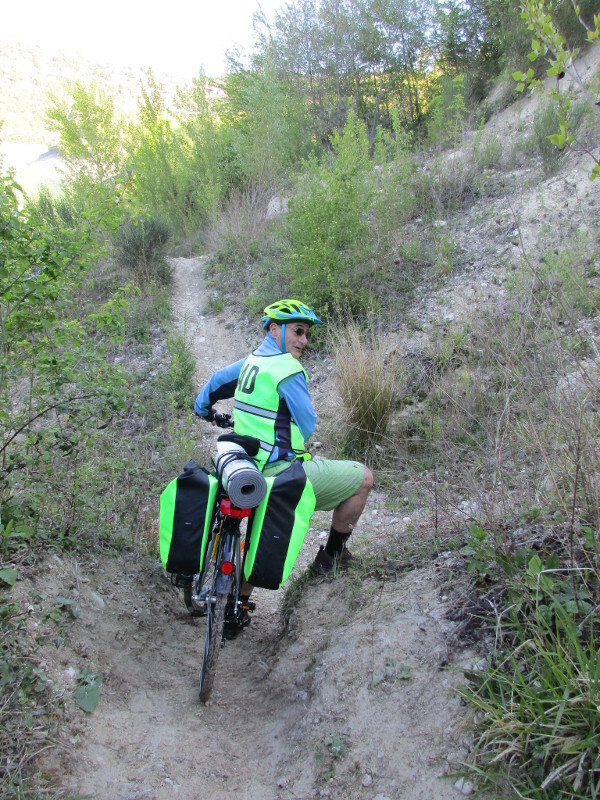 It got so steep we had to get off and push for the last few hundred meters. The entry is through a narrow entrance in a wall that is only really single file for cars. Then it is all cobbled streets and old higgledy piggledy buildings. Very charming. Total travel distance to get here was 53km. 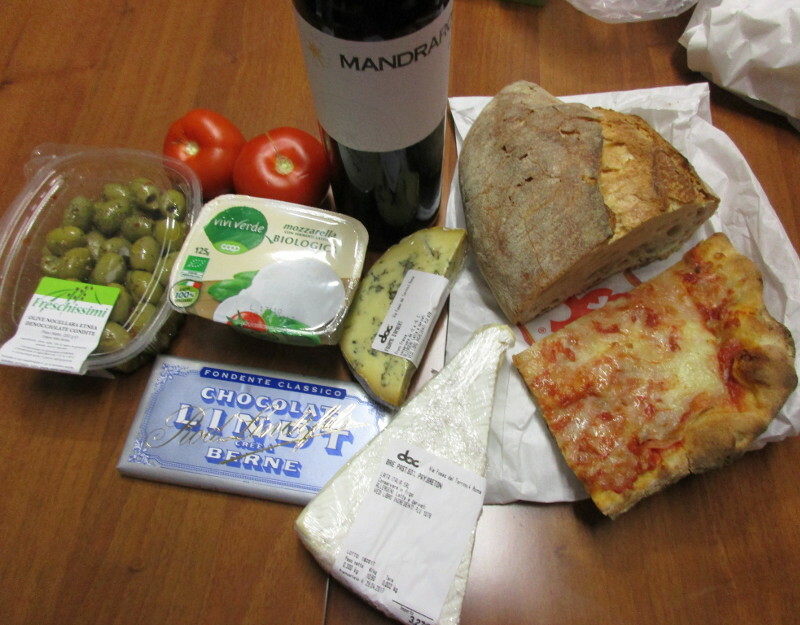 We found a supermarket and bought some supplies for the night. It was difficult finding our accommodation as the streets are like a rabbit warren – we probably saw most of the town on the way there. Most of the people out and about were mothers walking their children home from school. Cars can get down the streets, but single file and very slowly – so most people get around by walking. When we got to the apartment we tried ringing the bell and sending a text message to the proprietor, but it was all quiet and shut up. Eventually another occupant of the building came along and called the owner by phone for us. He appeared two minutes later. The apartment is up three flights of stairs, quite spacious and well equiped. It has a kitchen and washing machine (yay, no hand washing!). Our host locked our bicycles up in a lock up storage room on another street. 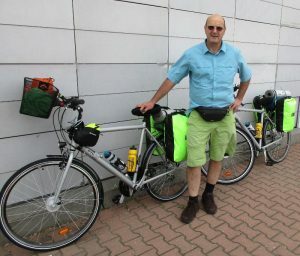 We are the first cycle tourist he has accommodated! Actually, we have not seen any other cycle tourists on route at all – clearly we are ground breakers for this part of Italy! 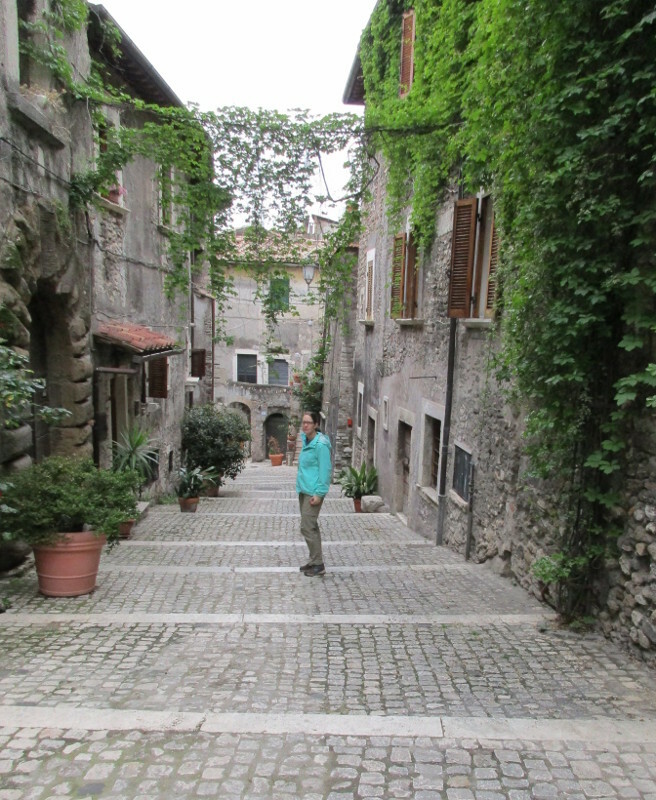 We went for a bit of a walk around to admire the town, then back to the apartment to drink wine and eat. We fell asleep early at around 7pm and woke up again at 5am the next morning! 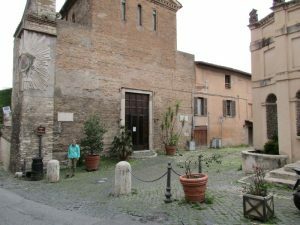 The Roman drivers are used to looking out for all kinds of irregularities at the side of the road – oddly parked cars, pot holes, joggers – ironically it is probably this chaotic state of affairs that keeps us safe, as we were just another obstacle to deftly avoid. 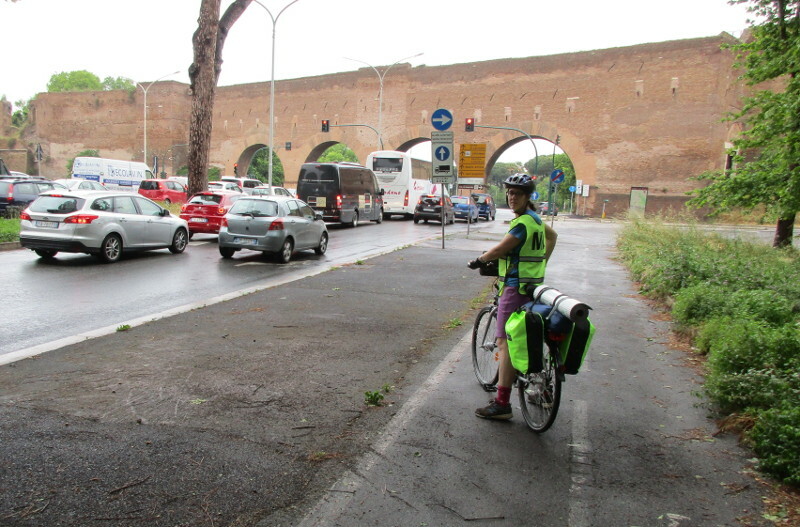 Italian drivers get top marks from us for courtesy to cyclists. They accept that cyclists have a right to be on the road and give them enough room (unlike drivers in NZ and UK). On every occasion where I have been trying to do something tricky, such as cross lanes in traffic, a driver has stopped to let me do so. 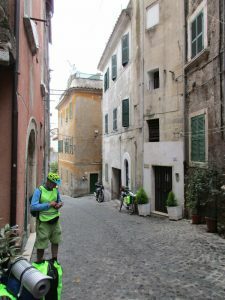 Rome prompted me again – as a cycle tourist you become aware of entering or exiting a tourism spot. Cities with tourist attractions have managed tourist areas. For example Krakow in Poland is a very ugly city with a couple of inner city blocks containing beautifully maintained and reconstructed historic icons. So tourists are herded into these areas, and they are essentially kept there because there is not much to see outside these areas. Then the tourists are relieved of their spare cash by having them pay for every move they make. Its like the tourists are cows that are herded into a holding area where they are milked by the locals. We spent a quiet morning resting in the comfortable kitchen in our lodgings. Kris worked a bit on Puzzlefoundry emails and I booked the next two nights accommodation. The weather was rainy, so that was good timing. In the afternoon we went exploring on the bicycles (just 20km ride). 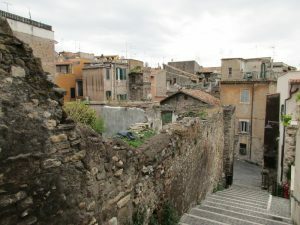 We thought we may find a suitable road to get into the city center (Colosseum etc), but could not. 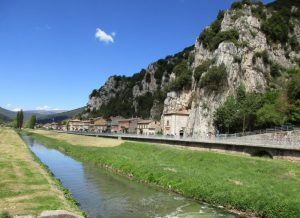 So we contented ourselves with exploring the closest district, called Quartiere Europa, which had been recommended by our hostess. 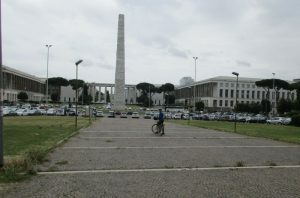 This is evidently a tourist attraction, built by Mussolini and an example of Fascist architecture. 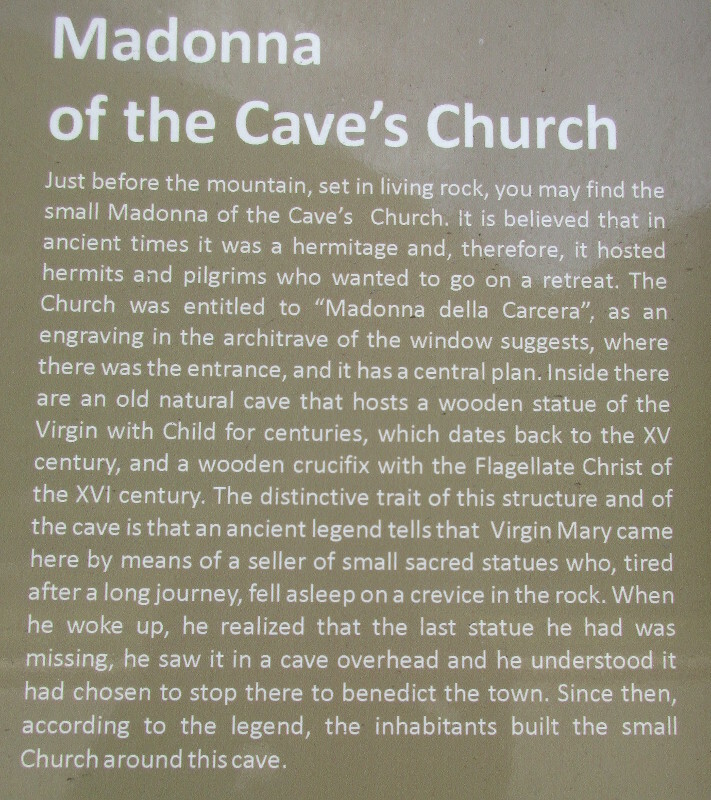 There are several parks and museums. 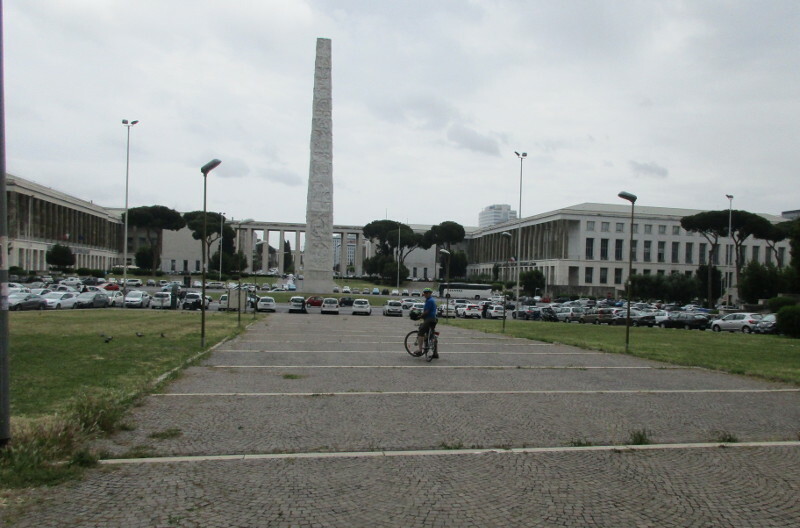 We were not too impressed – square buildings and a big obelisk, surrounded by chaotic traffic everywhere. We managed to find a bank machine to draw money and buy some goodies from the supermarket before heading back to the safety of our lodgings. Roman driving and road rules are baffling to us, but drivers are obviously well adapted to the conditions and mostly the traffic flows smoothly. They are fairly courteous around us as cyclists. Drivers communicate with each other using short toots to the horn (or maybe they are just greeting each other – either way it sounds mostly friendly – unlike NZ where the horn is usually used to signal road rage). We rode on footpaths quite a bit on our exploratory outing, crossing roads at pedestrian crossings. You can stand at a pedestrian crossing till the cows come home and not a car will stop for you. If you actually want to cross you need to make the first step onto the crossing, make eye contact and force your way across. Takes some doing when traffic is fast flowing. At one crossing I had to take the tactic of crossing alongside a local man. Parking is a total free for all – no rules and plenty of creativity. 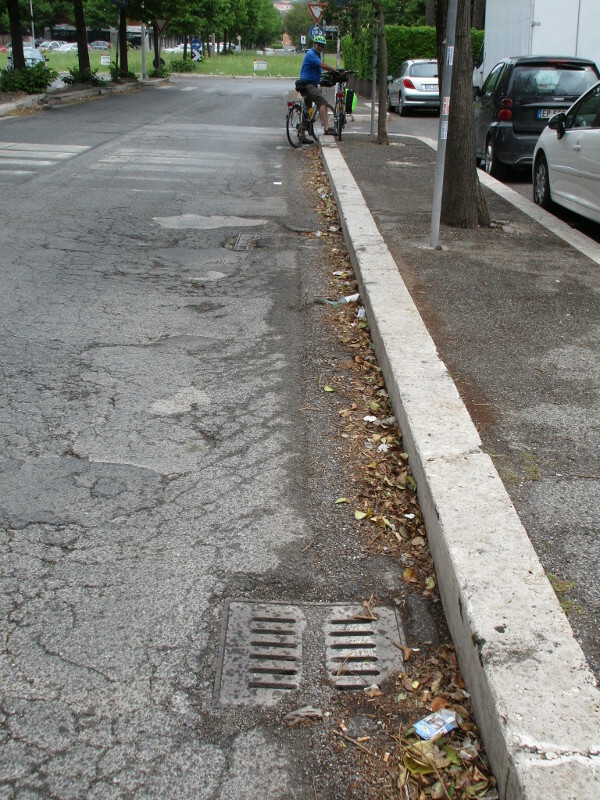 You can see why Italians specialise in small cars – they squeeze them any which way into places that don’t exist. Parking on pavement? – no problem. Parking opposite direction to traffic flow – seems common (but how do they do it?). No parking place at the supermarket? – park on the line dividing the two lanes coming in and out of the supermarket parking lot – no problem, cars can still get past and you are close to the entrance. Items that we would consider luxurious are cheap as chips in the supermarket, eg, Organic mozzarella – E1.07, Lindt chocolate E1.39. You can buy pizza by the slice and wonderful chewy bread. 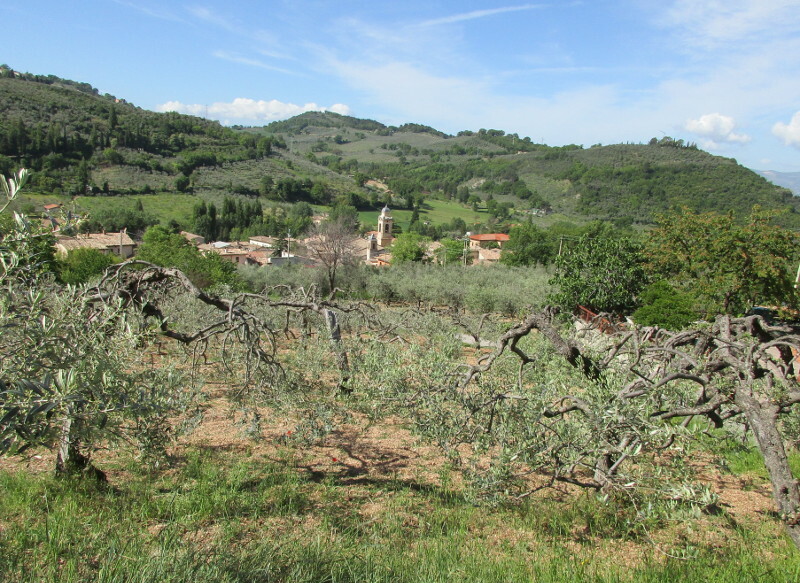 The olives are amazing – with beautiful texture not like the gelatinous lumps we are used to. The tomatoes are also quite different – firm and meaty – NZ supermarket offerings are watery in comparison. There are no auto check outs or express lines in the supermarket. Everyone has to queue at one or two check-outs. The first time I went into a supermarket to buy a toothbrush for Kris (his fell out in the plane – yuck), they let me in to the head of the line as I only had a couple of items and cash in my hand. At my second supermarket visit, a lady asked to cut ahead of me as she just had a loaf of bread. Luckily I understood the local custom due to my first experience! It seems this informal system works in the absence of any express lanes. 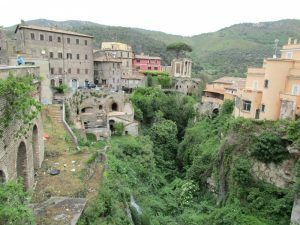 My Italian is non-existent and it seems that most Romans cannot speak much English at all (at least not outside of the tourist hot spots). Not too much of a problem if you are buying something – I am beginning to learn the numbers and gestures go a long way. Well we are in Rome, with two bicycles and in the accommodation we booked from New Zealand. Getting here can only be described as an endurance test. Firstly, we took four flights with a combined flying time of 26 hours, with waiting times of 2-3 hours in Auckland, Hong Kong and Frankfurt. Long distance travel really is a unique form of torture, that we undertake for the privilege of living in New Zealand and visiting the rest of the world. The low point was when we were assigned separate seats (one behind the other) on the 12 hour Hong Kong-Frankfurt stretch. Luckily they had done the same thing to another couple and we were able to swop seats around on the plane to everyone’s satisfaction. Then a large group of Chinese tourists got lost in Frankfurt airport (airport shopping?) and delayed our plane by another three quarters of an hour. Our tolerance was wearing very thin when they looked so relaxed and unhurried getting on the plane. 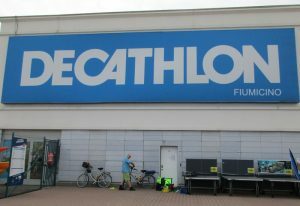 At Rome airport we found that it costs almost as much to take the metro to the Decathlon sports store as to take a taxi. Especially after I negotiated the taxi price down. I was amazed that it worked really – down from 25E to 20E – train was 17E plus a half hour walk on other side. 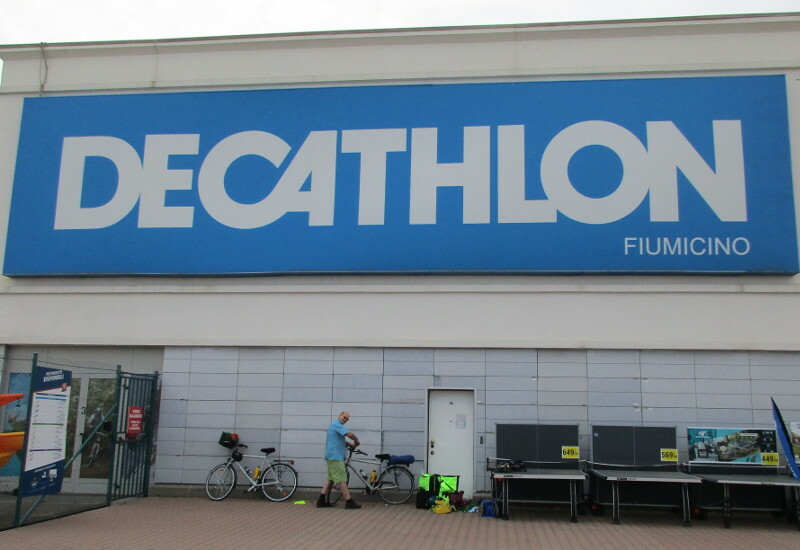 They had the bicycles we had ordered at Decathlon – so far so good. We spent a couple of hours putting everything together and were on our way by about 3pm. Everything looks ok, I am not too happy with the quality of the pannier bags, but we will make them work (or replace if we cannot). The reality of Roman roads soon set in. Far worse than expected. 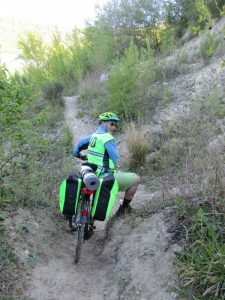 Kris says these are the most confusing roads he has navigated (from a cycling perspective). 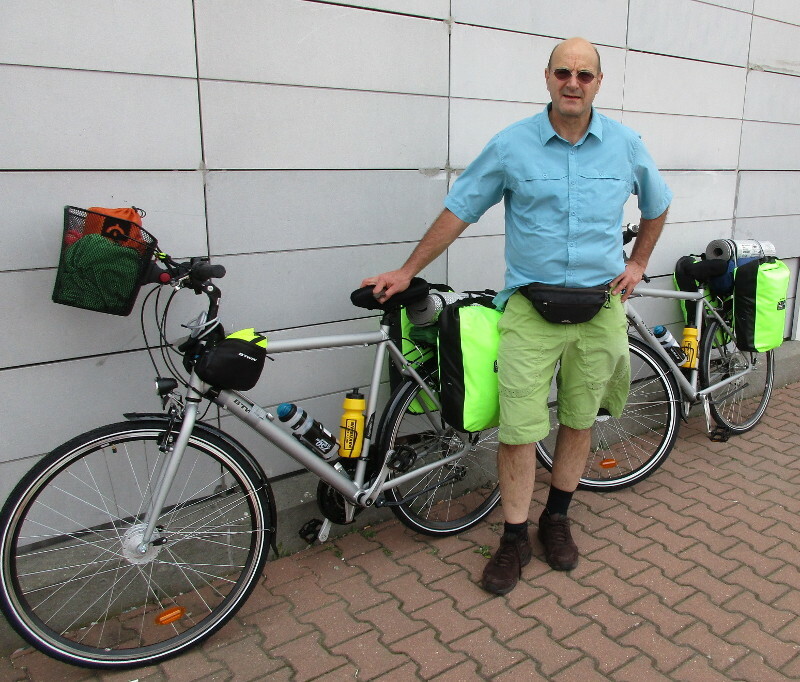 As a cyclist, it is difficult to cross highways – and getting to our destination, an expected 20km away, we were forced to cross the same highway about 5 times. We zig-zagged and back tracked the whole time to stay on roads where cycling is permissible (if not wise). The journey that is 15km by car took us 35km. We also had to stop frequently to consult the map on the phone and consider our alternatives (alternatives we tried did not pan out). The whole journey took us about 3 hours. I was just amazed at the poor condition of the roads. Many pot holes and wash outs, particularly on the side of the road, which is where bicycles ride. They also like putting drainage grids directly in the cyclist’s path. There is not really much space on the side of the road for cyclists, and naturally the traffic was heavy as we rode through the rush hour. We got out unscathed but the mobile phone took a fall out of Kris’s front basket. He went over a particularly large pothole instead of veering out in front of a car and it flew from the basket with the maps and tools. Bounced off the tarmac breaking the case and cracking the glass. I am impressed that it still works, but we wonder for how long. Exhaustion was really setting in when we finally got to our accommodation and attracted the owners attention to let us in after a while (I had a scary moment thinking we were at the wrong place!). The accommodation is really nice. We have a private room and bathroom, and shared kitchen and living room. She is also washing our clothes for $3 laundry fee! After unpacking and showering, we went and had some pasta, gnocci and red wine at the local cafe. It was very good.